Seismological Society of America > News > Journals > How Did Mexico’s Early Warning System Perform During Recent Earthquakes? How Did Mexico’s Early Warning System Perform During Recent Earthquakes? 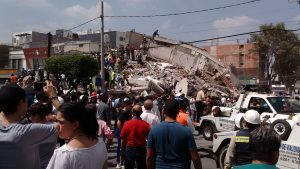 7 February 2018–Mexico’s earthquake early warning system gave Mexico City’s residents almost two minutes of warning prior to the arrival of strong seismic waves from the September 7, 2017 Tehuantepec earthquake centered off the southern coast of Mexico, according to a report in the journal Seismological Research Letters. The magnitude 8.2 earthquake is the largest earthquake detected by the alert system, known as SASMEX, since it began operations in 1993. SASMEX also sent an alert for the magnitude 7.1 Morelos earthquake that occurred on September 19, but the epicenter of the Morelos earthquake was much closer to Mexico City, allowing only a few seconds of warning prior to strong shaking. The alerts highlighted how some recent improvements to the system may help decrease the time needed to receive, detect and broadcast the alerts, but they also point to places where the system can improve in the future, said Gerardo Suárez, a researcher at the Universidad Nacional Autónoma de México (UNAM). SASMEX’s main focus is on earthquakes originating in the subduction zone off the southern coast of Mexico, where the Cocos tectonic plate subducts below the North American Plate. SASMEX tracks seismicity in the subduction zone through 97 seismic monitoring stations. The system also includes strong motion instruments placed further inland, closer to Mexico City, that monitor “in slab” seismicity; that is, earthquakes within the part of the Cocos plate that is already buried beneath the North American Plate. The Tehuantepec earthquake originated offshore in the subduction zone, while the Morelos earthquake was an example of in-slab seismicity. The monitoring systems communicate with data collection centers in cities receiving SASMEX alerts, through a redundant system of satellite links, Internet links and radio, in case any of these communication lines falls silent during an earthquake. The alerts to the public–a siren sound– are then sent through radio receivers, television and radio stations in several cities (including Mexico City, Oaxaca City, and Acapulco) that have subscribed to receive the alerts, and by municipal loudspeakers in Mexico City. Since 1993, the network has recorded 6,896 earthquakes and issued 158 seismic early warnings. After the September earthquakes, the Mexico City government launched a cell phone app called 911 CDMX that could someday be included as part of the alert network. “My major concern is whether the cell phone system in Mexico is capable of issuing a timely alert to the thousands of subscribers without delays,” said Suárez, explaining that the app is still in at an experimental stage. Like all earthquake early warning systems, SASMEX uses algorithms to process incoming seismic waves from earthquakes to determine the magnitude of the earthquake. Researchers at Centro de Instrumentación y Registro Sísmico (CIRES) have recently begun testing a new algorithm that would reduce the processing time needed to detect and decode seismic data, to deliver alerts faster, said Suárez. Discover what comes with an SSA membership! © Seismological Society of America 2019, all rights reserved. 400 Evelyn Avenue, Suite 201, Albany, California, 94706 • Phone: 510-525-5474 • Fax: 510-525-7204. A web creation by Tadpole Collective and LBDesign.